In a perfect world someone hires another to do a job, they do the job, and are then paid a fair wage. Obviously things aren’t that simple. 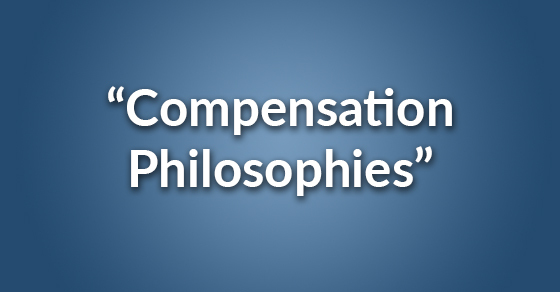 When thinking through an open position and recruiting for a new employee you might want to start thinking about a “compensation philosophy.” Here are some thoughts to get you started on developing a "compensation philosophy" plan. Do small annual raises really make sense?These are generally referred to as “cost of living” raises and are usually 2-3% depending on inflation. It may make sense instead to offer raises based on things like completing job related schooling or consistently outperforming set goals. Both of those examples are things that can indicate an employee is ready to move to a higher level job, thus earning a raise. Are you using the right benchmarks?Market rates are often good places to start when hiring a new employee. Salary surveys are useful tools to help budget but don’t always tell the full story. Be sure to keep in mind your own needs for the position as they may change the value of the position to you relative to the market around you. What employee behaviors are you rewarding?Keep your goals for an employee clear. For example, if you have a sales person that is routinely meeting their quota but isn’t building leadership skills like you want, then there might be a disconnect when it comes to discussing wages in an annual review. Is your incentive system overly complicated?Keep it simple and ensure everyone is on the same page. Unless you are hiring professional athletes, it is unlikely that your employees are constantly building an encyclopedia of stats upon which you can build a bonus structure. Keep goals clear and offer regular reports so everyone knows where they stand. Once you have developed a "compensation philosophy" plan that works for you, put it in writing. Make sure you, your managers, and employees all understand how the compensation philosophy works and the roles everyone plays in it. Keep an eye on it as your business grows and changes, your philosophy might need updating!